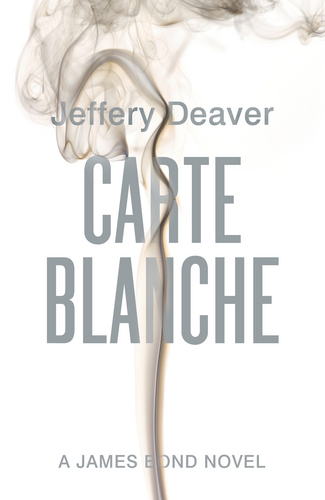 The new James Bond book, due to be published later this year and written by best-selling thriller writer Jeffery Deaver, is to be called Carte Blanche. Its title and cover artwork are unveiled today (Monday 17th January), at a special launch event at the InterContinental Hotel in Dubai. Like Fleming, Jeffery Deaver takes inspiration from exotic locations around the world, and after visiting Dubai for the Emirates Airline Festival of Literature last year he decided to set part of Carte Blanche in the United Arab Emirates City. Carte Blanche is due to be published by Hodder and Stoughton in the UK, a few days before Fleming’s birthday, on 26th May 2011. It has been commissioned by Ian Fleming Publications Ltd. Unlike the most recent James Bond book, Sebastian Faulks’ period piece Devil May Care, Jeffery Deaver’s Bond will have a contemporary setting. As part of his latest assignment, the modern-day secret agent travels with Emirates Airline and spends a number of thrilling hours in Dubai both meeting up with an old friend and tracking a very disturbing villain. The novel’s setting encompasses Deira and Port Saeed, and the history of the Emirates provides an exciting backdrop for some heart-stopping action. Bond is renowned for visiting the most exotic and glamorous of cities and this is the first time Dubai has featured in a James Bond novel. Jeffery Deaver will be making a special appearance at Emirates Airline Festival of Literature, on Tuesday 18th January, when he will be speaking about his love of Bond and his experience of writing Carte Blanche. Carte Blanche also features Fleming’s favourite car – a Bentley. Historically, Bond owned three Bentley cars in the course of the fourteen original novels written by Ian Fleming and, bringing the plot completely up to date, Bond drives a Bentley Continental GT in the new book. Jeffery Deaver has written 28 novels and sold more than 20 million books worldwide. He is best known for his Kathryn Dance and Lincoln Rhyme books, most notably The Bone Collector, which was adapted for film in 1999, starring Denzel Washington and Angelina Jolie. Before becoming a full-time author, Deaver was a journalist, like Fleming, and attorney. He started writing suspense novels on the long commute to and from his office on Wall Street. His books are now translated into 25 languages and he lives in North Carolina.